If you’re looking for an environmentally-friendly career path, opportunities abound. But what exactly is a green job? “It’s a pretty broad term,” said Mark Renn, CEO of The CS Team, a Denver-based career management services company. There are all kinds of jobs and industries that are “green collar” – alternative energy, recycling, biodiversity and more. If that’s where your interests lie, you can chart your education and career aspirations toward a sector that fits your talents and goals. An estimated $90 billion in federal money has gone into green jobs and companies. Some of those companies are struggling or failing, however, largely because the industry is, well, green. Renn said the industry is so new that the market as a whole is still developing. With so many companies dependent on federal funds, changing political tides can directly impact the viability of those green companies and jobs. “Given the volatility and the direction it’s all going, perhaps one of the best ways to make the strongest impact is (to ask yourself) ‘How can I make my career path as green as possible?’” Renn said. He recommends you research potential employers to find out which companies have strong green practices, no matter the industry. “I think looking for green jobs is great, but I would also say that your impact can be just as strong and just as great by being green-conscious in the industry you’re in,” he said. There are also green practices you can apply to any position to make it greener, Renn said. Small steps add up over time: shut off computers, phones and other electronics when not in use, unplug chargers, use paper instead of Styrofoam, carpool, use public transportation, fuel up at the right time of day and keep your car in good working order. All of these small items help improve the environment, he said. And, all of those choices apply to essentially any job. If you work from a home office where you’re conscientious about your power and paper use and you have no commute, you’ve already put many of these choices into practice. 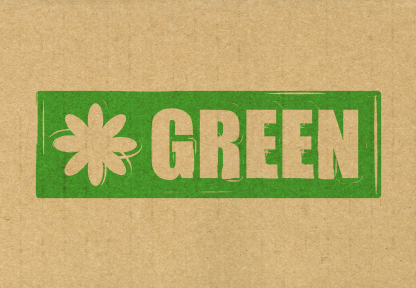 From that standpoint, going green is more of a lifestyle choice than a specific career path. “Wherever you go with your career, focus on being green in your everyday life and you’ll make a smaller carbon footprint and have a bigger impact,” Renn said.